One of the best things about iOS mobile applications is how developers try to create solutions for the practical needs of users. The popular Apple ad slogan “There’s an app for that” rings pretty true, especially in the case of health care software for the iPhone, iPod Touch, and the iPad. While there are several dozens paid applications in this category, you’ll be pleased to know there are a good number of free options that will address many of the exercise and health related needs of iOS users. From calorie counters, fitness apps, to kids’ health information; these apps can be very useful in helping us take better care of ourselves and our loved ones. Note: all the links in the headings below are to the App Store. No doubt many of you have a new year resolution for losing weight and watching your calorie intake. 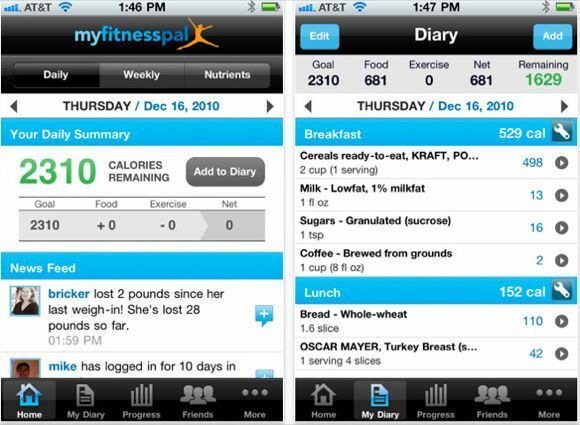 MyFitnessPal’s Calorie & Diet Tracker is like keeping a calorie diary on your iPhone. 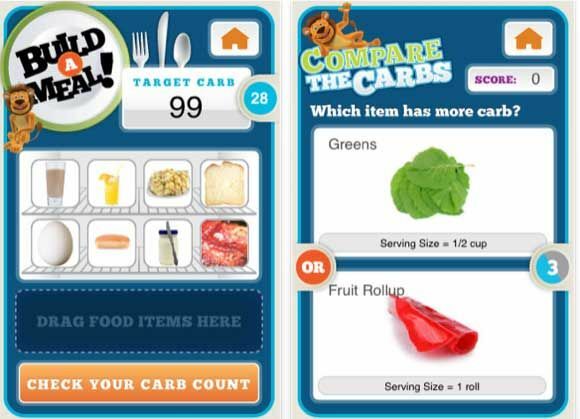 After you log in and register your weight loss (or gain) goals and your exercise habits, you can use Calorie Counter to tap into its large food database. 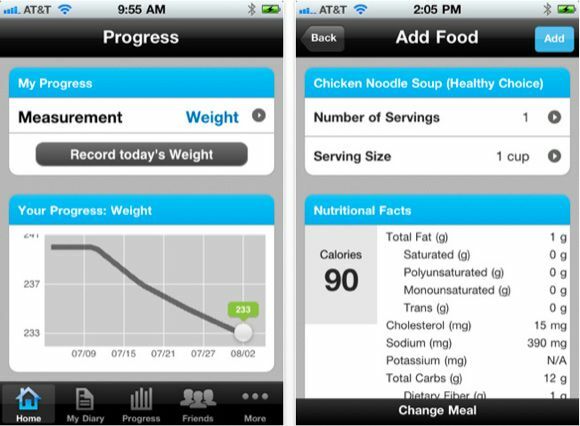 The app provides you nutritional facts about the food you eat. You log in and add the information about your meals each day, and Calorie Counter keeps track of your calorie intake and the progress you’re making toward your goals. The app also enables you to invite your friends to become a part of your weight watching program. Calorie Counter has very high ratings in the App Store. The more you learn to use it, the easier it becomes to maintain it as a daily log. 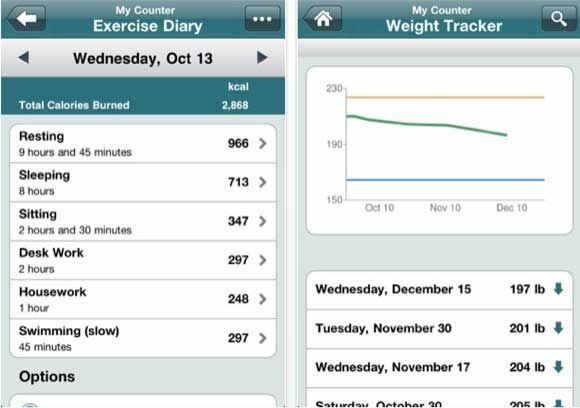 FatSecret’s Calorie Counter is another meals, exercise, and weight tracker for the iPhone and iPod touch. There’s also an optimized version for the iPad. In addition to its large database of food information, Calorie Counter includes a barcode scanner feature for getting more accurate data of the foods you eat. You can also browse menu information at nearly all national restaurant chains, as well as popular brand products from major supermarkets. You can save your searches and re-use them for future log entries. 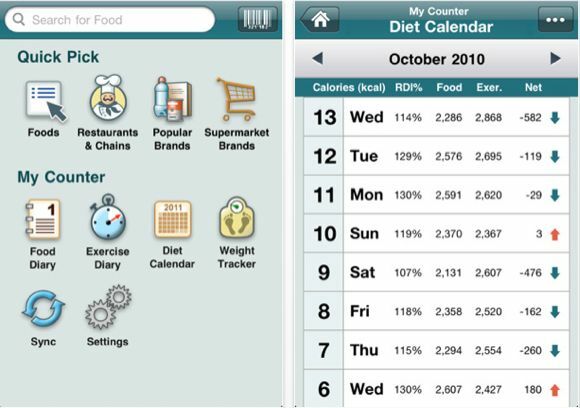 The user interface of Calorie Counter is very well done, featuring a diet calendar, exercise diary, weight tracker, and of course, a food diary. All your data can be synced to your Fatsecret.com account. For those of us looking to get a fitness regiment going, Fitness Free includes 300 exercise routines you can choose from and add to your fitness log as you complete them. You can also customize your exercises. Each exercise “recipe” includes instructions on how to perform the exercise and where it should fit into your daily or weekly exercise routine. The paid full version of the application offers other features, but this free version is enough to get you started. 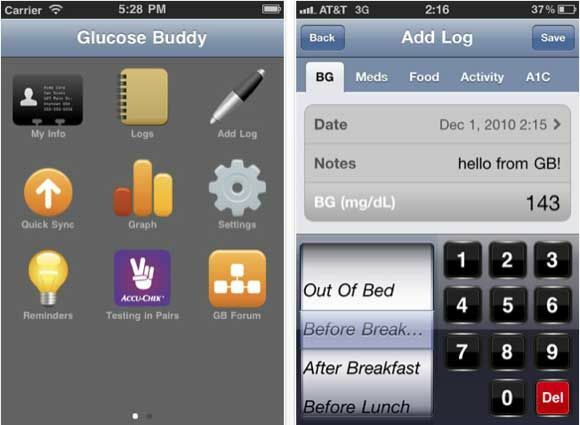 Glucose Buddy is well designed and graphically oriented, with graphs, log-in reminders, and the ability to sync information to your online account. Children can search food information by photos and save them to the photo library of their iOS device. 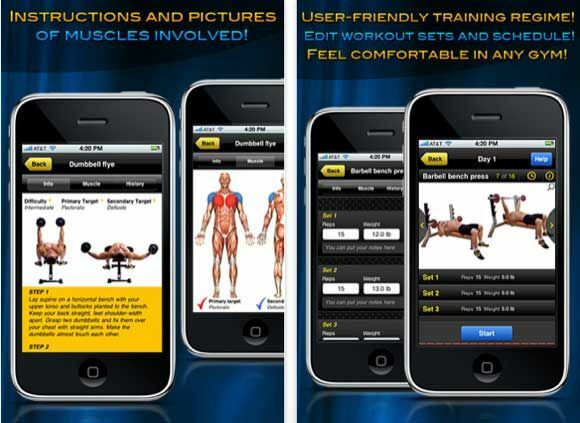 SparkPeople is the iPad and iPhone version of the popular exercise and fitness website, SparkPeople.com. This application is also well designed with lots of colorful graphic detail. In addition to helping you keep track of your food and calorie intake, SparkPeople can help you plan weight watching meals, keep track of your exercises, and the progress you”˜re making toward your weight goals. 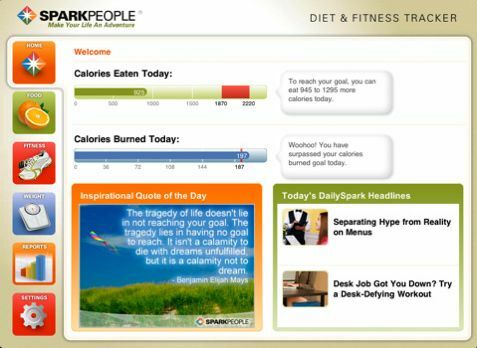 SparkPeople could possibly replace a couple of other fitness apps that do the same thing. While the app has many categories, it’s very easy to search food information and keep track of your daily meals and exercises. You can also link your information to your online SparkPeople account. We all should all have a general health reference guide that we can access at any time. 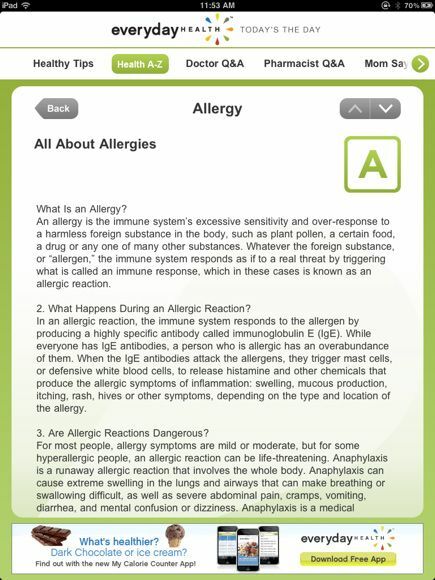 Everyday Health, Inc. has produced well designed and easy to use general health information application filled with descriptions about the top 50 health conditions, including allergies, eating disorders, HIV/AIDS, lung cancer, thyroid conditions, and yeast infections. The health care software for the iPhone includes hundreds of daily health tips, expert answers from doctors and pharmacists, and nutritional facts about various snacks that we love to eat. Its “What Would Mom Say…” list home remedies for common health problems like sore throat, sprained angle, sunburns, cold sores, and queasy stomach. 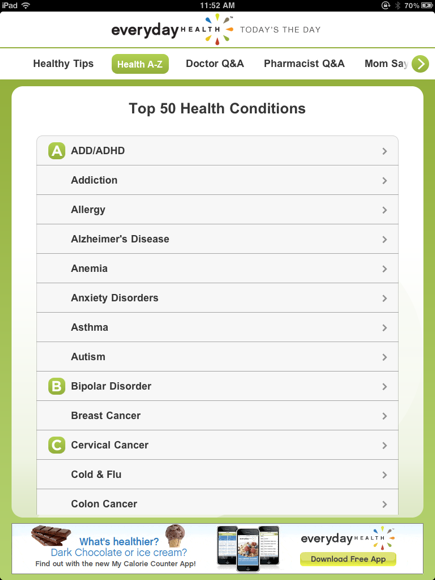 Everyday Health is like having a big 500-page medical reference guide on your iPhone or iPad. 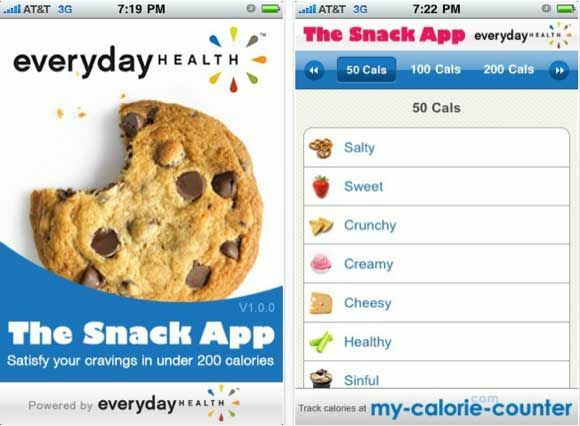 For us snack lovers, EverydayHealth has also produced an app for keeping track of the calories for the snack foods we love to eat. It breaks down food categories by the number of calories, and it also provides ideas for burning calories and making healthier snack choices. The app is visually designed and descriptions are easy to read, so there’s no reason not check out its content. This menstrual period and health tracking app is receiving high ratings in the App Store. The app’s calendar-style user interface is easy to navigate and helps women keep track of health-related issues such as weight, menstrual cycle, and emotional/physical well-being. The app of course sends you menstrual and fertility notifications, and its latest version allows you to set up any reminders you like, such as for drinking water, taking your pill, or getting a breast exam. 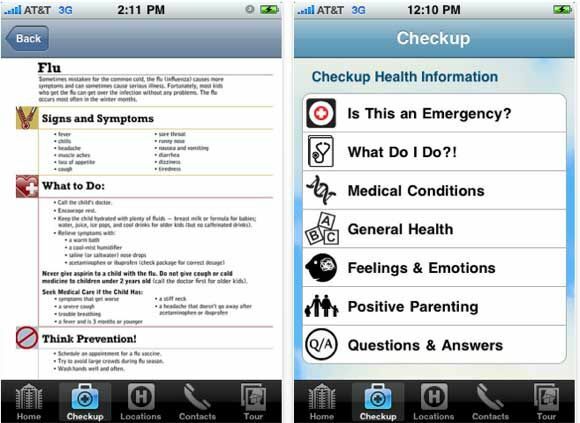 Designed by pediatric experts, KidsCheckup is a simple reference guide application that includes descriptions of medical treatments, such problems as asthma, common childhood orthopedic conditions, muscular dystrophy, childhood cancer, and cystic fibrosis. Its “What Do I Do” section provides information for symptoms and solutions for conditions such as asthma flare-ups, chest pains, chicken pox, coughs, dental entries, rashes, splinters. This app is a useful medical resource for parents. For even more health related apps and information on MUO, check out these articles here. If you know of useful free heath and exercise apps, please let us know about them.